Geologically, East Nusa Tenggara can be regarded as being divided into two zones: first, the volcanic inner curve formed by the islands Rinca, Komodo, Flores, Alor, Pantar, Adonara, Lembata and Solor, which have fertile soils and second, the out curve with limestone and rock formation, made up of the island Sumba, Sabu, Rote, Semau, and Timor. The total number of NTT inhabitants in 2001 was 3,888.735 - 1,919.644 (49.36%) men and 1,969.091 (50.64%) women. The most populated is Manggarai regency (621,989 people) and Kupang city is the most densely populated (1,517.30 people per square kilometer). Due to central highlands and their closeness to Australia, the seasons are irregular. Generally the islands are semi-arid, with a longer dry season lasting from March to November. The wet season lasts from December to March, but can be considerably shorter and small island of Savu. The average rainfall of this region is between 36 - 4,127 mm/year. The temperature is range from 20.3 C to 31.7 C.
East Nusa Tenggara is mountainous, and very steep slopes are everywhere besides some not too wide plateaus or uplands. The lowlands are a long the coastal areas only. Despite of the situation, most part of this region is not fertile, since the rainfall varies between 500 mm and 2000 mm a year. East Nusa Tenggara (NTT) is includes 566 islands. In addition, there are 524 uninhabited islands. It covers an area of about 47,349.9 square kilometers, including 200,000 square kilometers of maritime territory. Roughly 57 percent of the territory is hilly, with cliffs. The lowlands lay generally around the beaches and river mouths. 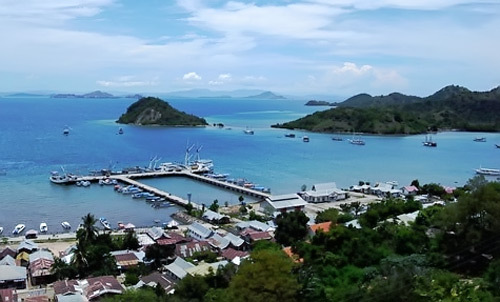 The area of East Nusa Tenggara occupies an area of 49,879.98 square kilometers, and has a population of more than 3,500.000. It is divided into 12 regencies and one municipality. Kupang regency is the largest region (7,178.26 square kilometers) and the smallest region is Kupang city (160.34 km2). There are a lot of languages spoken in East Nusa Tenggara coming from as many different which groups of the population. Bahasa Indonesia is the national language in Malay, written in Roman script and based in European orthography. In all tourist destination areas English is the number one foreign language fairly spoken and written.